Chinese buffet restaurant on George Street. 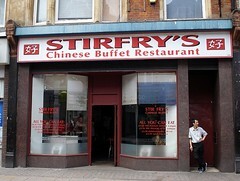 They also do takeaway (which also comes from the buffet). According to a photo on Flickr, as of c. 1980 the premises were occupied by a branch of Abbey National. Last edited 2019-01-22 18:04:48 (version 32; diff). List all versions. Page last edited 2019-01-22 18:04:48 (version 32).